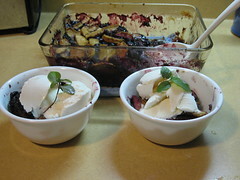 In the Pies, Cobblers, and Dumplings division, we have Blackberry Cobbler vs. Apple Dumplings. While no Southern potluck table would be complete without these (and don’t forget the homemade ice cream on top), the Southern Sweets Showdown is all about which one is better. At #4, Blackberry Cobbler is probably the one I’m most familiar with. While not a fan of fruit pies (see my Lemon Ice Box review—I’m a cake girl), it is still part of a Southern girl’s education to recognize one on sight and make one when your mother is laid up from making too many pecan pies in one day. The interwebz tell me that early colonists were so fond of cobblers that they often served them as the main course, for breakfast, or even as an appetizer. It was not until the late 19th century that they became primarily desserts. REALLY. So cobblers were our forefather’s Pop Tarts! I don’t care who you are, that’s cool. 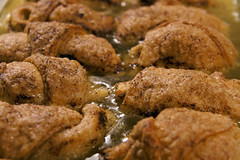 Apple Dumplings, however, are much more my style. Like pie’s eccentric cousin, dumplings show up at every family reunion and people make room for them. Fried or baked pockets of apple cinnamony goodness that are like single-serve crispy gooey pies, with maximum crust exposure (if I’m gonna eat pie, give me lots of crust). And guess what? ALSO BREAKFAST for settlers on the go. BOOM. So when your kids wake up and want pie for breakfast, just do what our ancestors did: dish it up. This post was written by Deborah Krauss who has written 4 posts on Real Southern Men.